Leo - check out the April & May (1971) issues of The Linking Ring. PM me if you need copies of the magazines. In Sept 1889, the Duke & Sons tobacco company released a set of 24 trade cards in association with their "Honest Long Cut" tobacco entitled "Tricks with Cards", each of which described a card trick. Trick #1 was a Rising Card (from a glass). Erdnase included a Rising Card trick (from the hands). Tricks #3 and 8 were Card Stabs (3 cards stabbed on a sword, single card stabbed on a wand). Erdnase included a Card Stab (Malini-style, single card stabbed on table). Trick #4 was "The Row of Ten Cards" as written up in Erdnase, under a different title. Trick #6 was where a performed slaps a deck held in a spectator's hands, leaving a singled (selected) card. Erdnase included this as a "Sleight for Terminating Tricks". Trick #9 has the effect of a single phase of "3 Card Monte". Erdnase included "3 Card Monte". Tricks #10 and 21 are based on the "Eight Kings" stack. Erdnase includes a discussion of the stack in "Tricks with a Prearranged Deck", and based a trick on it. Trick #12 is a selected card at a selected number. Erdnase accomplishes a similar effect, with a different method, in "Power of Concentrated Thought." Trick #17 is accomplished by use of the Glide, which Erdnase discusses and calls "The Slide". It may be that Erdnase was a smoker, and was familiar with this set of trade cards. An interesting find Bill! This tobacco company must have paid somebody well versed in card magic to write up the tricks on those trading cards. Since most of those card tricks appear in The Expert, you have to wonder if it might have been the author. Hey, thanks. Great find in terms of history. Does the explanation text scan as familiar? Jonathan Townsend wrote: Great find in terms of history. Does the explanation text scan as familiar? I've chewed a lot of gum and smoked plenty of cigarettes but only came up with comics and a smelly left hand. Where how do you find this stuff . I've only been "into" magic seriously for 20 years. I started collecting cards in the late 1970s, and have known about this particular set for a long time. I only just now took the trouble to compare them to Erdnase, though. John Moehring had an interesting article about these tobacco cards in the June 2001 issue of MAGIC magazine. Check out page 52. The article is in three parts. The second part is in the July 2001 issue of MAGIC. Check out page 54. And the third part is in the August 2001 issue of MAGIC. Check out page 50. There isn't really much information in the articles. It is mainly devoted to reproductions of the tobacco cards. The Erdnase/tobacco cards possible connection begs the question: Were the card tricks on those tobacco trading cards popular effects with card magicians in the late 19th century? Much like the packet trick craze of the 1970s. If yes then it might account for the appearance of those effects in The Expert. The author surely didn't just randomly pick out those effects for inclusion in the book. It would also be neat to know the identity of the magician who was contracted by the tobacco company to write up those tricks. Joe Mckay wrote: John Moehring had an interesting article about these tobacco cards in the June 2001 issue of MAGIC magazine. Check out page 52. The article went on for the next two issues, as well. It featured Burton Sperber's set of the cards, who also wrote them up in an issue of his publication "A Real Miracle". Potter & Potter sold his set in 2014. It went for $3400 plus buyer's premium -- over $4000. There are a couple of minor errors in the articles. The cards were released in Sept 1889, not 1887 (I found reference to their release at that time in an issue of Tobacco, a trade journal for tobacco producers and sellers). And "Honest Long Cut," the product in which the cards were inserted, was not a brand of cigarettes. It was a loose-cut tobacco, suitable for either rolling your own cigarettes, or for chewing. Leo, the Duke set of cards is highly rare, accounting for its high price. I don't know of another set that early which describes card tricks of this type. Leonard Hevia wrote: The Erdnase/tobacco cards possible connection begs the question: Were the card tricks on those tobacco trading cards popular effects with card magicians in the late 19th century? Much like the packet trick craze of the 1970s. I think they are (mostly) more or less "standard" tricks, popular then and now. The Rising Card and the Card Stab are timeless. Eight Kings goes back to 1876 (at least) (Hoffman's Modern Magic). "Selected card at selected number by different methods" .. that's most card tricks, isn't it? 3 Card Monte - a specialty of Canada Bill Jones (1837-1877). Eight Kings was first described in The Expositor, or, Many Mysteries Unravelled - Including that of the Learned Pig published in Boston in 1805 by William Frederick Pinchbeck. The trick begins on page 95: "By what manner the Pig is thought to know the card drawn". It is not the first cyclical stack: earlier examples exist - in Latin - going back to the late Middle Ages (cfr. Ye Olde Magic Mag, Vol. 2 #3). For anyone who cares, I'm pretty sure that the font of the front cover of the 1st edition of Expert is Post Oldstyle. The font was derived from the cover design of The Saturday Evening Post, which made me go "D'oh!" when I read it -- I've been staring at copies of covers of that magazine for over forty years, since I worked for an old magazine dealer in the 1970s who bought and sold them, looking at the illustrations by Rockwell, Wyeth, Leyendecker, Flagg, etc., and should have caught the connection long ago. The italicized "The" is not the italic version of Post Oldstyle, but looks to be from some other compatible font. A modern commercially-available implementation is Lamp Post JNL. The description of the Eight Kings set-up should be noted as another Erdnase error. He wrote, "Eight Kings threatened to save Ninety-five Queens from one sick Knave" which should be "for one sick Knave." Stephen Burton wrote: The description of the Eight Kings set-up should be noted as another Erdnase error. He wrote, "Eight Kings threatened to save Ninety-five Queens from one sick Knave" which should be "for one sick Knave." I see your point, it doesn't matter the actual word as long the performer knows that the word "from" is equivalent to the number four. I had just always read it as "for one sick Knave" and indeed Pinchbeck had it that way in 1805. It does seem to make more sense for the Kings to be saving the Queens from a sick Knave instead for him. That is, if you can attribute any sort of logic to a doggerel. Thanks for the link to the thread. Mel Stover wrote as "Rev. O. T. Slem" in A Fork Full of Appetizers II. After doing some research I’ve concluded that the word “from” in the Erdnase description of the Eight Kings setup is indeed an error. The following books from before and after the publication of The Expert at the Card Table all show “for one sick knave” as the last four words in the doggerel. The only example I could find in any book with the last four words being “from one sick knave” is The Expert at the Card Table. In publications, I could find a scant two examples and they are both in MUM. Harry Riser has it this way in the June, 1987 issue (and he is quoting Erdnase) and Ian Kendall has it as “from” in the December 2010 issue. Also Harry Stanley, Henry Hay, Jim Steinmeyer, Ralph Hull, Wilfred Jonson, etc. That I could not find any other example of the word “from” in the Eight Kings descriptions leads me to think that either S.W. Erdnase learned the doggerel incorrectly, deliberately changed the word “for” to “from”, or it was a typographical error. The most likely conclusion is, to me, that it was an error as I cannot believe would make a mistake in either learning the description or obfuscate the phrase by changing the logical use of the word, “for”. An interesting thing I learned from this research was the Sloane 424 manuscript from the 1600s has a stacked deck with the same Four, Ace, Six, Knave (soldier) sequence (Gibeciere, Vol. 5 No.2, Summer 2010). However, there was no mnemonic sequence given to learn this, although Stephen Minch provides a possible example. Typesetter or editor? Was it common to call the mnemonic a jingle? Last edited by Jonathan Townsend on August 30th, 2018, 6:11 pm, edited 1 time in total. I've been looking at the sequence as well. What struck me as interesting is that usually, it was "nine fine ladies" or "nine fair ladies" pre-Erdnase. Then Hoffmann, in Modern Magic, used "ninety-five ladies" and used it again in More Magic. Roterberg, in New Era Card Tricks, used "Ninety-five queens". William E. Robinson used "ninety-five ladies" in an 1895 issue of The Vaudeville (a variant of Mahatma). Hilliar, in Modern Magicians' Hand Book, used "ninety-five ladies". It came out in 1902 as well, but wasn't copyrighted until later in the year, well after Erdnase. Others have identified Sachs, Hoffmann, and Roterberg as sources for Erdnase. I'd suspect that he learned the Eight Kings stack from Hoffmann. The "Eight Kings" stack makes an interesting appearance in the newspaper detective comic strip "Kerry Drake" in June 1945. The villian, Shuteye, needs to get a message to his moll, Roulette, but knows he's about to be picked up by Kerry. "Gripping the bridge cards firmly, Shuteye writes on the edges . . .
Then he shuffles the cards and pencils a question on the top card! 'Remember the one about 95 Queens and a sick Knave?' "
6/28/1946 -- Roulette has received the deck. Swiftly arranging the cards by the secret formula, Roulette sees on the edge . . .
'Midnight . . . Boat . . . Foot of Surf Street' "
Kerry and his assistant, Gabby, capture Roulette and the deck. He orders a bunch of magic and gambling books from the library. Gabby discovers the secret of the Eight Kings stack in an "Encyclopedia of Card Tricks".
" 'When d' cards are fixed in that order, this writin' on d' edges stands out like a "porched" egg on a plate of hash!' "
Gabby, hoping to impress Kerry, goes alone to the boat to capture Shuteye. But things go awry from there . . . . This same ruse of writing a secret message on the edge of a deck stacked in Eight Kings order is also used in the newspaper serial prose story "Murder on the Avenue" by Carolyn Wells (1942). Bill Mullins wrote: The "Eight Kings" stack makes an interesting appearance in the newspaper detective comic strip "Kerry Drake" in June 1945. The villian, Shuteye, needs to get a message to his moll, Roulette, but knows he's about to be picked up by Kerry. That almost reads as a presentation for Gertner's Unshuffled trick. In the erdnase text a few sentences down from the stack- is mention of tricks with named numbers and cards. I don't know who came up with it or whether it came before the English version - I found it on a blog by Jean-Francois Gérault that has lots of information (in French) about various stacks, including some early references, at http://jeanfrancoisgerault.blogspot.com/2017_06_23_archive.html. "S. W. Erdnase? He's Andrews!" I was informed offline that this has been brought up on the forum twice already, and that one of the bringer-uppers was me. Sorry about that. Was it the summary before the reveal? From the Moline, IL Dispatch, of 8 March 1946. Silvis -- E. Erdnase of Carbon Cliff was arrested last night and jailed on a charge of reckless driving. The Carbon Cliff motorist was still in jail this morning awaiting arraignment before Magistrate Lawrence Bobb. This is the only time I have ever seen any indication that the name "Erdnase" was possibly the real name of a real person. Without further details, however, it is possible that in this case Erdnase is a typo on the part of the court or the newspaper, or a false name given by the actual driver. Bill Mullins wrote: From the Moline, IL Dispatch, of 8 March 1946. Dare I ask if a check of the 1940 or 1950 census for that locale has already been done? I've checked 1940 and earlier censuses many times, through several different access portals. no luck. The 1950 census has not been released by the Census Bureau yet. It has to be 70 years after the census before they will make it publicly available, so it will become searchable sometime after 2020. 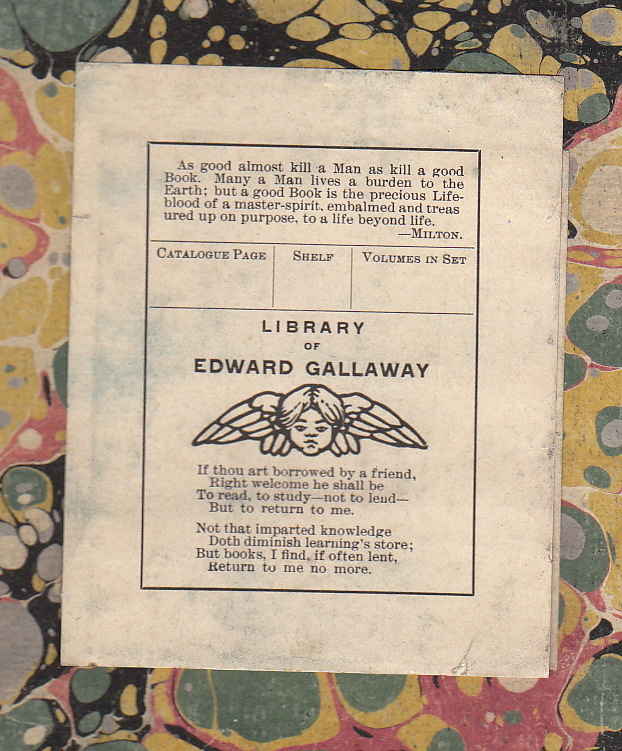 Edward Gallaway's bookplate includes a cherub ornament in its design. That ornament can be found in the specimen books of the American Type Founders, which also include samples of the font "Post Oldstyle". As I mentioned above recently, that seems to be the font used on the front cover of the book. ATF's Chicago Office was at 203/205 Monroe in 1903, only a couple blocks north of Printer's Row in Chicago. I don't for a moment believe that Gallaway's ornament and Erdnase's font sharing a common source is evidence that Gallaway and Erdnase were the same person, although I wouldn't be surprised to see that suggested soon. ATF was a dominant source of type. It's like saying that both Gallaway and Erdnase used Microsoft Windows, therefore they were the same guy. To me, the likely inference is that Gallaway's employer used ATF products, so it was straightforward for Gallaway to use ATF products when designing his bookplate. I expected to also see the "acorn" device which is used on the front cover of 1st edition copies of Expert in this specimen book, but haven't located it yet. The McKinney bankruptcy records include reference to supplies of a font named "Old Style"; perhaps it is the same one. Possibly I missed the reference, but I did a search in this topic of Hofzinser and I am posting the information that I have discovered. Perhaps it was covered previously, so I apologize if this is redundant. Bart Whaley, who did extensive research on the identity of Erdnase, contributed 90% of the material in the book, THE MAN WHO WAS ERDNASE, co-authored by Jeff Busby and Martin Gardner, allowed me full access and a copy of his book/notes. I recently found this advertisement and Whalet's hand written note that references Hofzinser's Kartenkuste (Feb. 1925 Sphinx) and a translation by James Harto. Incidentally, Whaley was referred to as "the father of deception" at the Central Intelligence Agency. Who did the Hofzinser translations that appeared in the Sphinx in 1922? Richard Kaufman wrote: Who did the Hofzinser translations that appeared in the Sphinx in 1922? I have posted in the past my candidates for the authorship of Expert at the Card Table, James Andrew. Just to recap, the original manuscript for the artifice section, I believe, was written by James Andrews, who was related to Milton Franklin Andrews, and the French Lick Dealers. The manuscript was then given to Oliver Victor Limerick and some of the illustrators from the Blue Pencil Club (part of the New York Press Club) to write some of the text and illustrate. The manuscript was then given to Jim McKinney for printing and was caught up in bankruptcy. The manuscript made its way through two sources T. N. Doutney and the original founders of the Society of American Magicians, where the magic trick section was added and further illustrated by M D Smith. There is much more to the story but that is it in a nutshell. I posted earlier how Journalists and Illustrators, during that time period, manipulated the stock markets via the Bucket Shops. The text and illustrations published in Monthly Journals and newspapers had hidden code to transmit the stock market fluctuations allowing for stock market manipulation to corner the markets. The subject I would like to bring up today concerns the illustration given from M D Smith to Martin Gardiner and the hidden code that it possibly contains. First: On the paint pallet you will find the word Lade. This I believe is referring to the Latin word meaning “Mother of Helen”. Greek mythology states that Zeus came to Helen of Troy in the form of a swan and impregnated her with twins. This seems pretty far fetched but please stay with me. You will also find an image of a swan in the left leg of the painter. If you follow that lead you will find that there was a book written called Helen’s Babies, written by John Habberton. This book was made into a silent film starring Beryl Vera Nassau Adams. She played The mother of Helen in the movie. She was related to James Andrews. Second: The word Hill is also found in the leg. James Andrews was related to the Hill family and it was also used by Milton Franklin Andrews as an alias. Phonography, Morse Code and Shorthand were all methods used to transmit information to the bucket shops. If you look under the word Hill, you will find in morse code the letters E and R. Using Photography you will find it spells Hillier. Third: In the base of where the magician is standing you will find the words W. G. Mortimer. He was the author of Puru, A History of Coco, and the first president of the Society of American Magicians. He was related to James Andrews through his first wife Sara Ann Adams. Fourth: Just Under the base you will also find the words Burt C. This refers to Andrews Burt Cobb the famous illustrator and a founding member of the Blue Pencil Club. It even has his signature paint brush that can be found in some of his cartoons. Burt Cobb was related to Benjamin F Cobb from the Jack Henderson book series that M D Smith illustrated between 1902 through about 1905. Burt Cobb was related to James Andrews and worked for The Puck and The Judge Magazines. Fifth: If you look at the front of the base of the cartoon, you will find the letter G. Now look at the letter upside down and you will find the letter D formed by the outline around the same letter G. Next to the letter D, there is an outline of the Letter H. If you look on the other side of the D you will find a small cartoon caricature of a man on his knees. By using Phonography, you will see that it says H+D+Man on his knees, which equates to HOUDINI. Six: If you look where M D Smith signed the cartoon you will find three names in one. Smith uses photography to spell out two of the names. The three names listed in the signature section are M D Smith, T N Doutney and HOUDINI. Seven: If you look at the cards that the magician is juggling, you will see, inside the cards morse code creating the words ERDANSE WAS HOUDINI. This can be hard to spot but keep looking, he uses some of the card sides as dashes. Smith had incredible vision. The cartoon also contains a picture of a woman, the head of a man that Sargent, the second president of the Society of American Magicians, used in his book Smoke and Bubbles. By the way that book was illustrated by Nella Fontaine Binckley. There is quite a story about Smith, Clinton Burgess, Sargent, Houdini and Fontaine. The picture also has clues that are written in shorthand. See if you can find them! Hint: Use the Campbell Shorthand Technique. I humbly ask that you to be polite if you have any responses to this post. There is no need for character assassination. I am just proposing a theory, not running for Supreme Court Justice.